Hundreds of dirt bike and ATV riders took to the streets all across Philadelphia on Sunday afternoon, 10/14, in honor of a popular rider who was shot and killed four years ago. Up to a thousand riders swarmed the roadways on the fourth anniversary of the death of 23-year-old Kyrell Tyler, also known as 'Dirt Bike Rell'. He had a large following on social media and posted videos of his bike riding and stunts. Dirt Bike Rell was shot and killed while sitting in a car in Southwest Philadelphia in 2014. 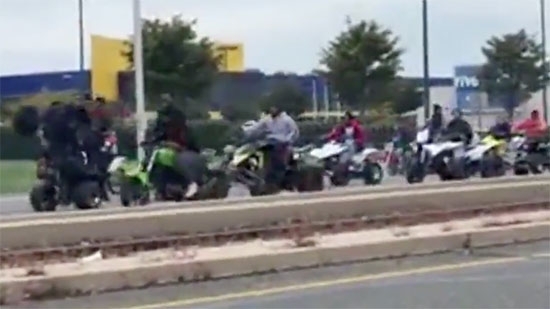 Riding dirt bikes and ATVs on the street is illegal in Philadelphia, but for the most part police just monitored the situation on Sunday. There were around 20 arrests and 30 vehicles were confiscated. Police are investigating a hate crime after racist fliers were found in Cherry Hill, NJ, this weekend. The fliers were found in the Old Orchard section of Cherry Hill specifically on Waverly Road, Lampost Land, and Mimosa Drive. The leaflets were placed in plastic bags with some rice to weigh them down and thrown on neighbors lawns. Those fliers had various racial and hate messages targeting African Americans and Jews. They also contained a logo for the Loyal White Knights of the Ku Klux Klan and a phone number at the bottom. "We understand people have a right to free speech but this type of behavior, coming in the dark of night and throwing these on people's lawns is cowardly. If you want to contact me and have a conversation I'll be more than happy to have a conversation with you, but the way you're going about it is not acceptable," said Chief William Monaghan. Three men were shot early Sunday morning, 10/14, as they left a house party near Temple University in North Philadelphia. It happened just before 2 a.m. on the 2200 block of Watts Street near Susquehanna. There was some sort of argument and a gunman opened fire. A 24-year-old man was shot in the arm, a 23-year-old man was shot in the left buttocks, and a 21-year-old man was shot in the hip and elbow. They were transported to Temple Hospital and are listed in stable condition. No arrests have been made.